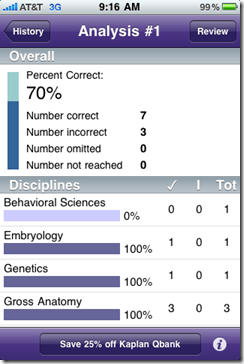 Kaplan USMLE Step 1 Qbank iPhone App is a Winner! 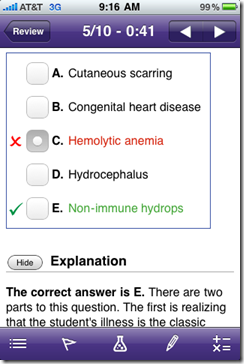 Here we review the free version of the Kaplan Step 1 QBank App from Kaplan in conjunction with TakeFiveLabs, which features 100 free high-yield USMLE-like questions from Kaplan Medical. One important note though is that this release is as a stand-alone app unable to integrate with existing Qbank accounts. In other words, the 100 questions featured in this app are separate from the existing Kaplan Qbank set. This app was released in March as a “test” to generate feedback and guide development of a full version of the Kaplan Qbank app (which is underway with the positive feedback they have received so far from this app), and all indications are that it will be compatible with existing Qbank accounts. Although the Qbank features Kaplan Medical content, it is powered by TakeFiveLabs – “systems engineers at the intersection of design, media, and technology.” TakeFiveLabs dabbles in a variety of projects as it “seeks new ways to improve the human-computer experience”, and has developed other apps including MyCalmBeat, What’s Invasive, Twitflick, and GMAT preparation. Though TakeFiveLabs may represent a young and innovative enterprise, the TakeFiveLabs library appears to include solid, well-reviewed, respected apps. And they definitely seem to be on the right path with this app. 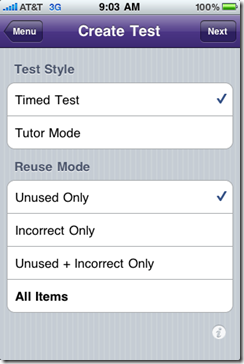 As for the app itself, the home screen (shown left) offers access to four functions: Create Test, Test Analysis and Review, Overall Progress, and Flagged Items. 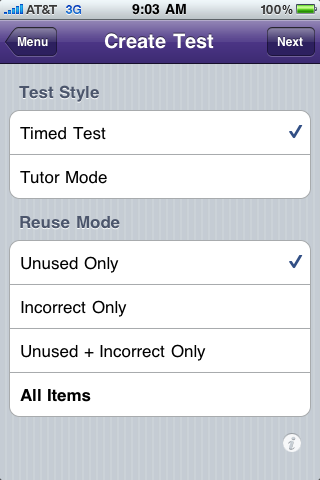 The “Create Test” function (shown below) allows for the choice of timed or tutor modes, as well as the selection of unused and/or incorrect questions, or all questions. 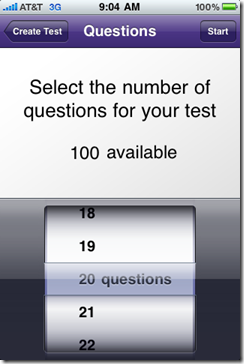 Next, the user can select the number of questions (1-100) desired for the test (shown below). The questions (example shown below) are polished and of high-quality, as expected from Kaplan Medical. Also of note, some questions have associated media (sound, video) similar to the Step 1 examination. Notice the bar at the top, which indicates which question of the test the user is on, and how much time is remaining (for the timed mode). 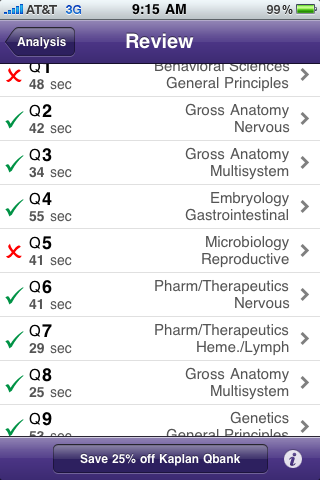 Alternatively, the tutor mode allows for untimed use of questions with explanations after each question or at the end of the test, as desired. Regardless of the mode, similar to the classic Qbank, there are buttons available for pausing and ending the test, as well as checking one’s progress, marking the question, common labs (shown below), a space for notes, and a calculator. 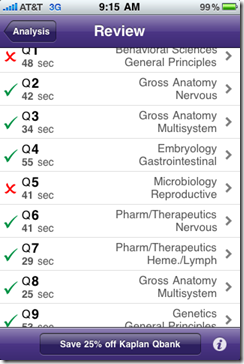 At the end of a timed test, the test review (shown below) shows whether each question was right/wrong/unanswered, the time spent on each question, and the discipline and organ system of each question. 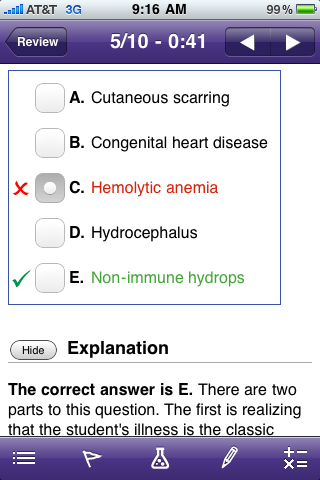 From here, the user can access the questions (marked with the guessed answer and the correct answer) with high-quality Kaplan explanations. 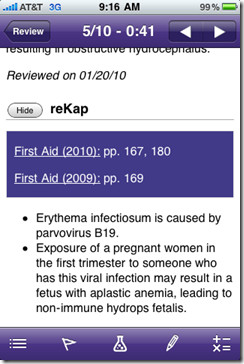 Also included with the explanations are Kaplan’s trademark reKaps (shown below), which include references to First Aid, MedEssentials, and other study materials, as well as concise bullet points offering a summation of the material covered in the question. 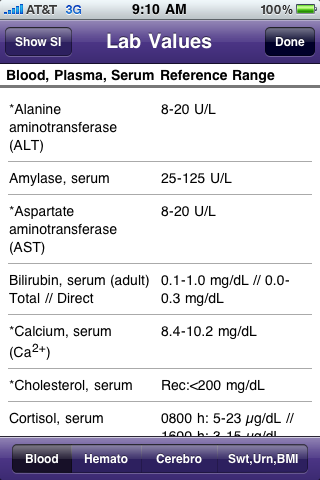 Users can also access test analysis (shown below), which shows the percent and number of questions correct, incorrect, omitted, and not reached for that particular test, as well as the breakdown of test questions correct and not correct by discipline and organ system. 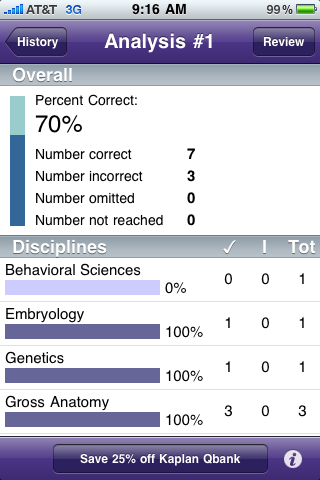 Moreover, users can check their overall progress from the home screen (shown below), which offers a display similar to the aforementioned test analysis, but cumulatively for all tests taken. In summary, this so-called “test version” offers the promise of an incredibly useful Step 1 preparation app, and has generated very positive feedback thus far for its developers. Its primary two drawbacks – its limited bank of 100 questions and its inability to integrate with existing Qbank accounts – appear to represent concerns that will be addressed in the full version that is in development. Pricing: This “test version” of the QBank (containing 100 questions) is free. As discussed earlier, development of a full version is underway, and pricing has not been set. 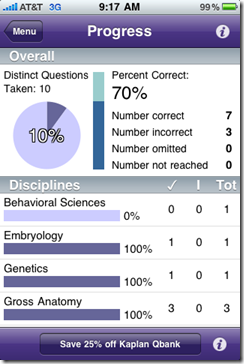 Conclusion: The Kaplan QBank app serves as a promising (though currently limited to only 100 questions) stand-alone Step 1 study tool, and once the full expanded version rolls out with the ability to integrate with existing Qbank accounts, will represent a powerful study tool for the many medical students who trust Kaplan as they prepare for Step 1.